• So Zuzanna, Agata, Malwina, Emmanuela, Lena and Jamie, the big day has arrived, and I bet you’re probably both a bit excited and a bit nervous as well. • You’re all nicely dressed to celebrate the first time you will receive Jesus in Holy Communion. • And the way your dressed might look a bit like you’re going to a wedding, although of course you’re not. But there are some similarities here. • Often when a man and a woman get married, even though they’re adults by that point, they are often at least a little bit nervous, and their parents might be nervous as well. • When two people get married, it’s because they love each other, and they promise to love each other till the end of their lives. • Holy Communion is a bit like that as well. • Jesus loves us so much, and we heard Him say to us in the Gospel to us that He will be with us to the end of time, and one of the ways in which He is with us to the end of time is Holy Communion. • Jesus is always here in the church, in the tabernacle, and from today onwards, you will be able to receive Him each time you come to Mass. • Sometimes, it might be that after you have been to Mass you feel really happy and holy; at other times you might not feel anything. • But it’s a bit like when we meet our friends, at school or on our holidays. Sometimes we might be really excited to meet them, or at other times we might not feel anything. • Now you’ve probably been told a bit about healthy eating at school, and sometimes people say “you are what you eat”. If you eat healthily, then you will be happier and healthier than if you eat the wrong sorts of food, or not enough of the right sorts of food. • Normally, when you eat food, your body turns it into a part of you. So maybe when you eat a carrot, your body breaks it down and uses it to help you see better. • With Holy Communion, instead of our bodies turning it into part of us, the opposite happens. We become more like Jesus. • Now that doesn’t mean that girls will turn into men and grow beards. • What it means is that we begin to love God more, we begin to become kinder to other people and more loving. 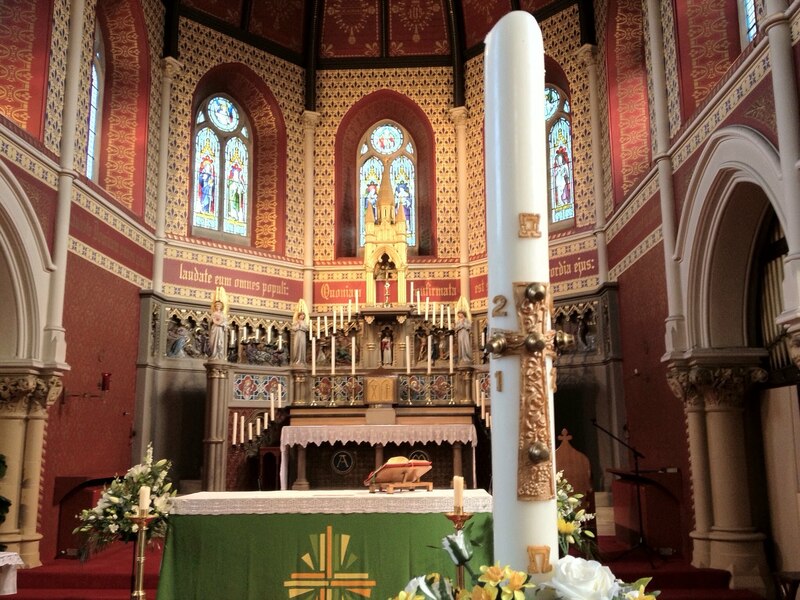 • Just as a carrot helps us to see better in the dark, receiving Jesus in Holy Communion helps us to spot that there might be other people who need our help, or to realise that Jesus is the Light of the World, and that we need His help if we are to be better people. • Today, as well as being your First Holy Communion Mass, is also a day when we celebrate the fact that there is one God, who is Father, Son and Holy Spirit. • If you listen very carefully to the words of the Eucharistic Prayer later on, when the bread and wine become the Body and Blood of Christ, you will hear that this is one of the things we ask God to do: we ask God the Father to send His Holy Spirit on all those who receive Holy Communion, that we may become one body in Christ. • It might sound a bit complicated, but there is an easy way to understand it. • Think of a jigsaw puzzle. It has all those different pieces, which are all different shapes and sizes. • If you look around the church, at all the people in church today, you will see that they are all different shapes and sizes too. • So, just like all the pieces of a jigsaw puzzle fit together to make one big picture, we ask that as we receive Jesus today in Holy Communion, we might all fit together and live and work together in peace. • Then, together, we will do the work that Jesus want us to do in our world today. • That’s enough from me. • So, even though you might be a bit nervous, enjoy receiving Jesus for the first time today, and as you grow older and receive Him again and again, watch and see how He helps you to be the person He wants you to be.